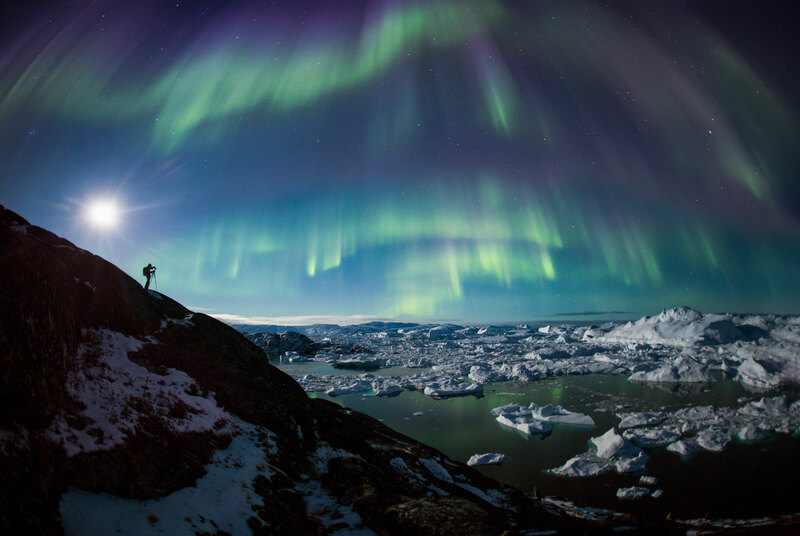 Paul Zizka tells us how he captured a beautiful shot of the northern lights over Ilulissat Icefjord, Greenland. This was the last night of a photography workshop I led in Greenland. At nightfall, we made our usual hike up to the Ilulissat Icefjord to see if the aurora borealis would come out to play. Did it ever! Even the full moon was no match for the dancing curtains. The sky exploded with color and the participants were treated to amazing conditions. Whoops and hollers filled the night as we watched ice floes drift below the green sky. For this image, I asked fellow photographer Stephen DesRoches to stay still while I shot the scene with a fisheye lens to emphasize the grandeur of the moment. 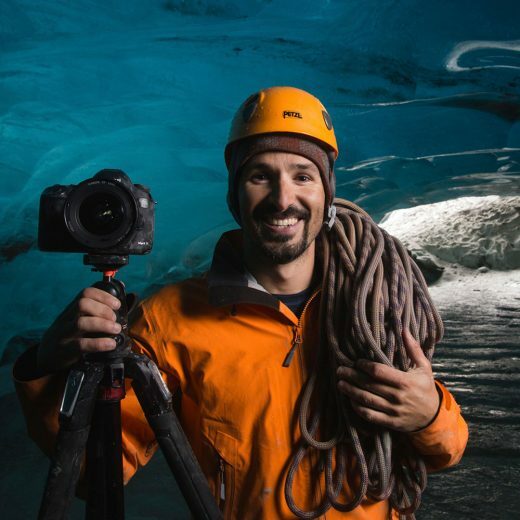 Paul Zizka is an award-winning mountain landscape and adventure photographer based in Banff, Canada, as well as a Fellow of the Royal Canadian Geographical Society. With photographer Dave Brosha, he runs OFFBEAT, a company that features workshops in far-flung locations and an online community for photographers. Zizka is the photo editor for the Canadian Rockies Annual. His images have appeared in Maclean’s, National Geographic Adventure, The Guardian, Canadian Geographic, PhotoLife, explore, and many others. Cite this Article: Paul Zizka “One Great Shot: Dancing Skies in Greenland,” Hakai Magazine, Dec 7, 2018, accessed April 26th, 2019, https://www.hakaimagazine.com/videos-visuals/one-great-shot-dancing-skies-in-greenland/. Fewer Inuit youth than ever are learning how to become hunters in Greenland. What does it mean for their culture? Drone master Keith Holmes documents an enormous jellyfish bloom in British Columbia.